In Japan, 'simple living and high thinking' is often the principle followed when building homes. Simple but smart architectural lines and soothing colour palettes find predominance in many modern Japanese abodes. 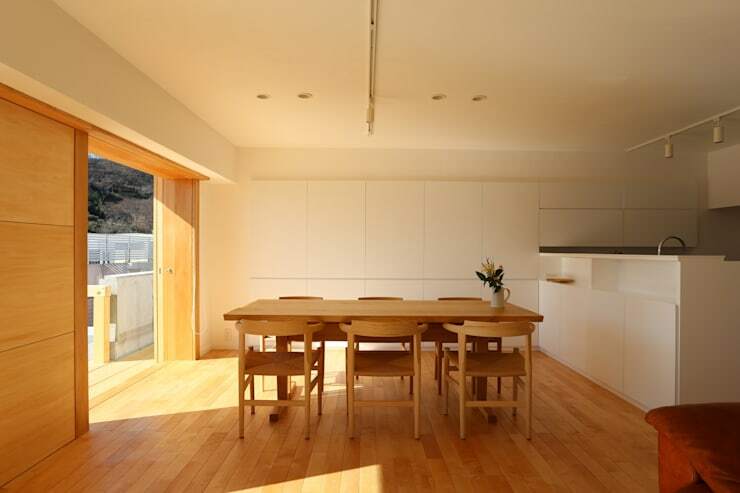 And today, we will take a close look at a contemporary residence in Ashikaga, which was renovated with intelligence, a sharp sense of aesthetics, and focus on the minimalistic needs of the owner. 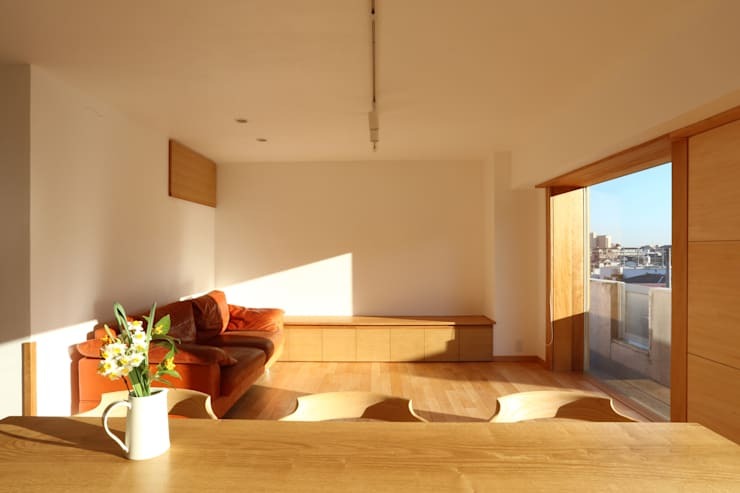 The team at Takayuki Suzuki Architects finally delivered a home which is bright, airy and replete with a feeling of openness. Once we start looking at the changes, you will get to appreciate how wood and the purity of white have transformed a dreary house into a neat and visually appealing place of comfort, serenity and joy. So let’s begin! 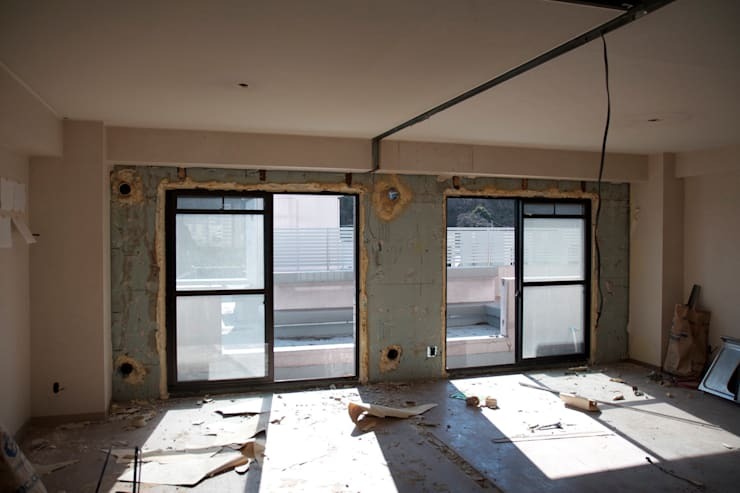 Before the renovation, the walls of the interiors were peeling off in places, and the overall look exuded a feeling of neglect and dilapidation. The lack of befitting decor and furnishing made this space appear inhospitable. But the home had potential, which the architects instantly picked up on. In particular, the large sliding glass doors offered them ample inspiration to take the area to a whole new level. They believed that they could convert the old structure into something which the owner would yearn to come back to, every single day! Post renovation, the abode now features a bright and breathable living zone which seamlessly integrates with the dining area. A single large couch in an interesting shade of tan adorns the living room, and offers a stunning view of the cityscape both during the day and at night. The walls are now pure white with light wooden accents strewn here and there. The flooring and doorway also celebrate the natural goodness of wood, and flaunt the owner’s love for everything organic! The wall at the far end houses a long wooden seat, which also offers adequate storage space underneath. The dining space gets flooded with bright and sensuously warm sunlight throughout the day. The table comfortably seats six, and is a simple wooden affair along with the modern, minimalistic chairs. A single white ceramic jug has been quaintly placed on the table for holding a fresh bunch of flowers, to add some fragrant softness to the area. The contemporary kitchen in white flanks the dining table on the right, and wows with its clean lines and uncomplicated functionality. Large white tiles line the wall adjacent to the kitchen and provide visual depth easily. Here is a glance at the dining and living area after sunset. White screens roll down to conceal the large glass doors in order to protect the home’s privacy. The screens also complement the white walls amazingly well. And the space which was infiltrated with sunlight during the day, now gets to bask in the glow of smart recessed and focused lighting. The lighting is powerful enough for you to see things clearly and walk about at ease. But it is also relaxing and warm, thereby allowing you to feel invigorated for the next morning. One look at this kitchen will make it evident for you why cleanliness is next to godliness. A spotless shade of white reigns supreme in this cooking haven, whether it’s the floor or the sleek cabinets. There is no dearth of storage room for cutlery, crockery, dinnerware, as you can see. Nothing crowds the chic stainless steel countertop unnecessarily. 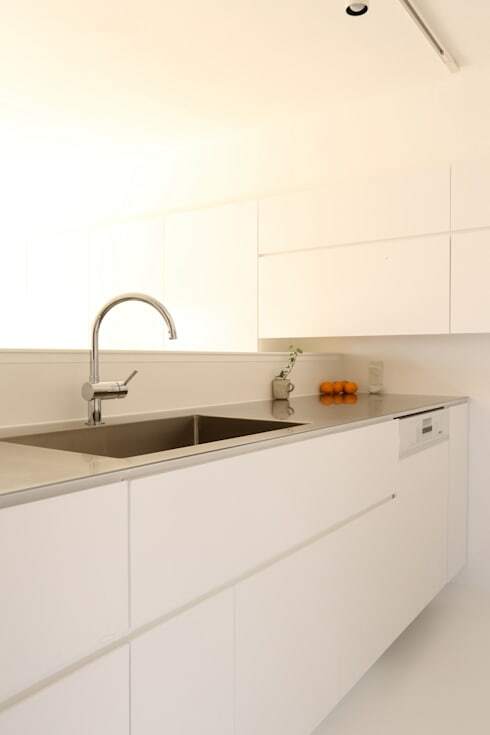 The faucet is slim, minimalistic and enhances the general clutter-free appearance. a sprig of green in an old bottle and a couple of vibrant fruits are the only things breaking the monotony of this predominantly white kitchen. Also, don’t miss out on the fact that because the kitchen is half open, the sunlight flooding the dining space, also cheers up the cooking area. 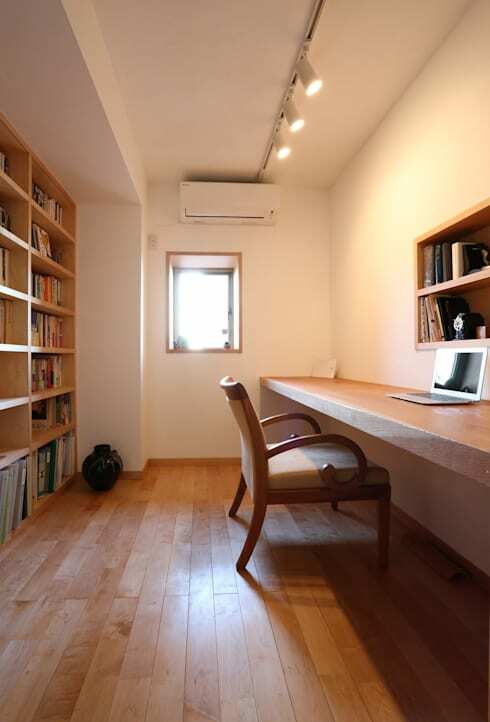 Lavish doses of light-coloured wood and pristine white make their way into the study or reading room too. A long solid wall-mounted table on the right provides sufficient space as a workstation if you wish. It cleverly saves on the floor area too. A stylish, solid and cosy chair sits in front of the table, while a single window lets in oodles of sunlight for natural illumination. The chair faces a sleek in-built wall shelf above the table, which offers additional storage besides the massive wall to wall unit on the left. The shelves are not just ideal for housing endless books, but they can also be employed for displaying artefacts, knickknacks and mementos of professional or academic achievements. Focused lighting on the ceiling promise ample brightness in the evenings and will help you to get all tasks done. The curvy black vase near the floor to ceiling shelf is an artistic touch which lends the room personality. The bathroom of this residence is an example of how small spaces can emerge as nooks of delights. Slim wooden planks line the walls and ceiling while white tiles rule the floor. 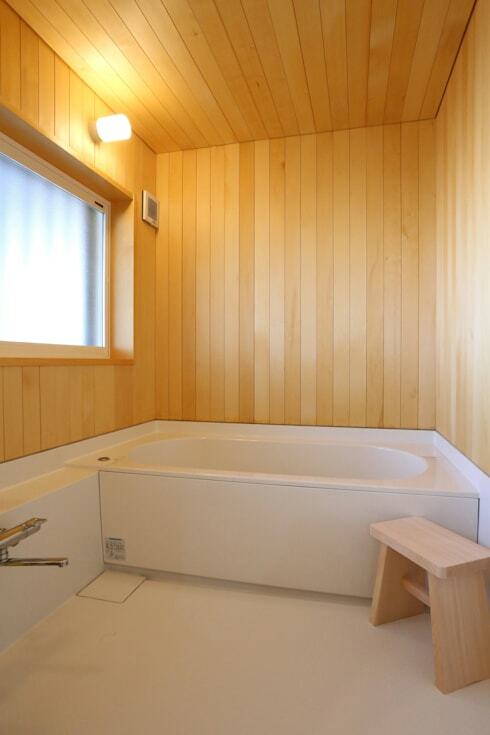 A simple but tidy bathtub waits for you to sink in warm, rejuvenating water after an exhausting day. A minimalistic wooden stool stands near the tub and is perfect for you to sit and relax while you are drying your hair or applying a beautifying face pack. Or else, the stool can also be used for keeping towels and robes or other bath essentials. A fair sized frosted glass window allows diffused natural light to permeate the washroom for a charming look and feel. For the evenings, a bright and calming wall light exudes energy and positivity with élan. We are sure that this renovation project has been able to inspire you with novel ideas and feed your creativity! This house in Ashikaga is an example of unpretentious simplicity where openness, love for nature, and intellectual pursuits rule the roost. Every element of the abode is functional, snug, and charms the observer with its modern, progressive design. Here is another ideabook to inspire you further - Before and After: A French Apartment Transformed. What do you think of this gorgeous transformation? Let us know in the comments!